Lenovo Thinkpad Mini Dock Plus Series 3, 433810U docking station is ideal for notebook users who need easy access to the Internet/LAN, multiple USB devices, audio and video equipment, and robust key lock security. Includes: Left corner alignment for easy system attachment. Convenient eject button for one-step system removal. Six USB 2.0 ports, located on rear of unit. Five video ports: Up to three, of the five, video ports can be used simultaneously: ThinkPad systems with NVIDIA Optimus technology. Up to three monitors can be attached and ThinkPad display is enabled (ThinkPad display is active). ThinkPad systems with integrated graphics, or other discrete graphics: Up to two monitors can be attached and the ThinkPad display is disabled (ThinkPad display is blank). VGA analog monitor supporting 1920x1200 resolution. Two Single-Link DVI-D digital monitor supporting 1920x1200 resolution. Single-Link DVI-D port does not support attachment of a DVI-to-VGA monitor adapter. Two DisplayPort monitor supporting 2560x1600 resolution. Supports attachment (compatibility varies by ThinkPad system) of DisplayPort monitor cables. Using DisplayPort monitor cables reduces resolution to 1920x1200. Audio ports: Analog microphone in, headphone out. e-SATA storage connector. RJ-45 Ethernet port. 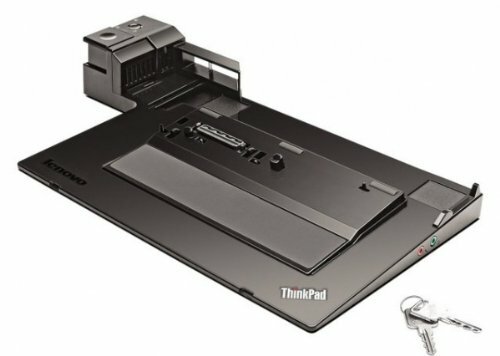 Integrated key lock and cable lock slot physically secures the ThinkPad system and ThinkPad Mini Dock Plus Series 3. The cable lock and key lock operate separately. The separate key lock, on the side of the ThinkPad Mini Dock Plus Series 3, secures the ThinkPad to the ThinkPad Mini Dock Plus Series 3. Includes a ThinkPad 90W AC Power Adapter. Hardware compatibility: ThinkPad: L412, L512, L420, L520; ThinkPad T400s, T410, T410i, T410s, T410si, T420, T420i, T420s, T420si, T510, T510i; ThinkPad T520, T520i (Dual Core Models only); ThinkPad X220. 2x DisplayPorts; 2x DVI-D ports; 1x VGA port. 6x USB 2.0 ports. Includes 1x ThinkPad 90W AC Power Adapter. 1x Analog microphone in; 1x Headphone out. 1x e-SATA storage connector. 1x RJ-45 Ethernet port. Integrated key lock and cable lock slot physically secures the ThinkPad system and ThinkPad Mini Dock Plus Series 3. Cable lock sold separately. Supported ThinkPad Models: X220, X230, X220t, T400s, T410, T410s, T410i, T410si, T420, T420s, T430, T510, T510i, T520, L412, L512, L420, L430, W510, W520, and T520 Dual Core models.